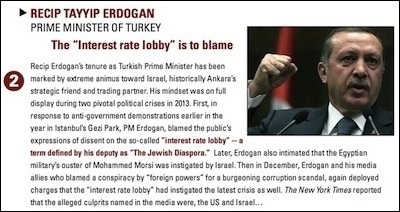 Turkish President Recep Tayyip Erdogan finished second in the Simon Wiesenthal's 2013 Top Ten Anti-Semitic/Anti-Israel Slurs list. None of this happened half a century ago; the timeline here covers only a span of a year and a half: A Turkish-Kurdish pop star wrote on her Twitter account, "May God bless Hitler. He did far less [than he should have done to Jews]." The mayor of Ankara replied: "I applaud you!" Hundreds of angry Turks, hurling rocks, tried to break into the Israeli diplomatic missions in Ankara and Istanbul. The mayor of Ankara said: "We will conquer the consulate of the despicable murderers." He blamed the Charlie Hebdo massacre in Paris on Israel's Mossad. Islamist columnists close to the government suggested imposing a "wealth tax" on Turkish Jews (who are full citizens). A governor threatened to suspend restoration work at a synagogue. And a credible research group at the Kadir Has University in Istanbul found in a poll that Turks view Israel as the top threat to Turkey. Against such a background, Turkish and Israeli diplomats are negotiating a historical deal that will, in theory, end Turkey's hostility toward the Jewish state and normalize diplomatic ties between Ankara and Jerusalem. Turkish and Israeli diplomats are negotiating a deal to normalize diplomatic ties between Ankara and Jerusalem. In 2010, a Turkish flotilla, led by the Mavi Marmara with hundreds of jihadists and anti-Israeli "intellectuals" aboard, sailed toward the coast of Gaza, aiming to break Israel's naval blockade of the Hamas-run strip. Israel's naval blockade aims to prevent weapons such as rockets being smuggled into Gaza. To stop the flotilla, naval commandos of the Israel Defense Forces boarded the vessel and, during clashes, killed nine aboard. Since the incident, Turkey's Islamist leaders have pledged to isolate Israel internationally and have downgraded diplomatic ties with Jerusalem. They have put forward three conditions before any normalization could take place: an Israeli apology, compensation for the families of the victims and the removal of the naval blockade on Gaza. After President Barack Obama's intervention, Israeli Prime Minister Benjamin Netanyahu in 2013 apologized for "any error that may have led to the loss of life." Turkey's two other conditions remain unfulfilled. But diplomatic teams from Ankara and Jerusalem are apparently working on a deal. There are good reasons why an accord may or may not be possible. Since the nearest Turkish election is four years from now, neither Turkish President Recep Tayyip Erdogan nor his prime minister, Ahmet Davutoglu, has any reason to cultivate further anti-Semitism at election rallies in order harvest votes from conservative masses who are deeply hostile to Israel and Jews. These are days when Turkey's leaders need not practice their usual anti-Israeli rhetoric. There is another reason related to "timing" that makes a deal attainable. After pledging to isolate Israel, Turkey has become the most isolated country in the region, especially after the recent crisis with Russia that emerged after two Turkish F-16 fighters shot down a Russian SU-24 aircraft along Turkey's Syrian border on Nov. 24. In its region, Turkey does not have diplomatic relations with Cyprus and Armenia. It has downgraded diplomatic relations with Israel and Egypt. It is confronted by Shiite and Shiite-dominated regimes in Iran and Iraq, respectively. On top of all that, an angry Vladimir Putin, Russia's president, curses and threatens every day to punish Turkey. Turkey buys over half of its natural gas and 10% of its oil from Russia. Therefore, a third incentive could be a mutually beneficial future deal for Turkey to buy natural gas from Israel. If the two countries build an underwater pipeline, Turkey can compensate for the potential loss of Russian gas supplies, starting in 2019. For Israel, a pipeline to Turkey would be the most commercially feasible route to export its gas to Turkey and other potential buyers beyond. How does Netanyahu shake hands with a man whom he knows ideologically hates Israel? A Turkish-Israeli handshake would also be music to ears in Washington. Deep hostility and occasional tensions between its two allies in the Middle East have always been unnerving for the U.S. administration. The road ahead has its problems. Turkey's second condition for normalization, compensation, is not too difficult to overcome. But the third condition, that Israel should remove the naval blockade of Gaza -- and risk weapons being smuggled into the hands of Hamas (or other terrorist groups) -- could be an unsafe move for Israel. It would be truly embarrassing if a Turkey-Israel normalization results in new arms shipments into Gaza and rockets over Israeli skies -- with the only achievement being a temporary peace with Turkey's Islamists, who never hide their ideological kinship with Hamas. If Netanyahu decides to take risks and go for a deal, he must make sure that however the naval blockade of Gaza would be eased, it does not expose Israel to the risk of new acts of terror. Another risk is the potential psychological domino effect any deal could cause. It is certain that Turkish Islamists will portray any deal as a success story -- that they were able to "bring Israel to its knees." This message, relayed through a systematic propaganda machine, could set a dangerous precedent and potentially encourage Arab Islamists to consider more assertive policies toward Israel in the future. The future Turkish and Israeli ambassadors would always have to keep their bags packed, ready to return to their own capitals at the first dispute – which could be caused by Israeli retaliation against Arab terrorism or anything that may make Erdogan roar in front of cameras, "Our Palestinian brothers ... Those murderer Jews again ... Go back to your pre-1967 borders or you'll suffer the consequences!" Netanyahu's problem is that he does not trust Erdogan in the least. He is right not to trust Erdogan. But then how do you shake hands with a man whom you know ideologically hates you and wishes to mess up things at his earliest convenience? Burak Bekdil is an Ankara-based columnist for the Turkish newspaper Hürriyet Daily News and a fellow at the Middle East Forum.